Albion boss Chris Hughton praised his side's character after they fought back from 2-0 and 3-2 down to draw 3-3 at Brentford this afternoon. Brighton trailed 2-0 at half-time to goals from Jota and Harlee Dean and keeper David Stockdale then saved a Lasse Vibe penalty to prevent the Bees from going 3-0 ahead just before the hour. 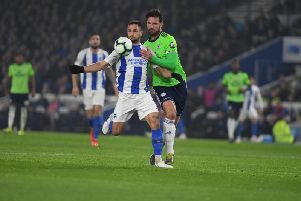 Goals from Solly March and Shane Duffy drew Albion level but Brentford went back ahead in the fourth minute of injury-time through Konstantin Kerschbaumer. However, with just seconds remaining Tomer Hemed headed the equaliser from Anthony Knockaert's cross. Hughton said: "It was a strange first half, if I look at the differences between today and Thursday's performance at Huddersfield, I thought we were better today and threatened in the first half more so than Thursday but we found ourselves 2-0 down. "It felt strange and a little bit unjust but that's the game. "But to come back is a good feel. Anthony Knockaert can sometimes get a little bit frustrated as he so desperately wants to win but the two crosses for the headers were exceptional. "I know we've got character in the side but we're perhaps not playing as well as we'd like. We're certainly conceding goals, which is unlike us, but to score right at the end leaves it with a nice feel." Hughton also praised keeper Stockdale and said: "He's made three penalty saves and they've all been pivotal saves for us. All three have allowed us to go on and get a result. If we'd gone 3-0 down, I don't think we'd have come back."